“What is devotion? Devotion is great, unshakeable appreciation of and confidence in your teacher and in the Buddha, Dharma, and Sangha. You feel how precious and superb they are. You treasure your connection to them. You are certain that if you rely on them you will attain every spiritual goal you are seeking, and be able to accomplish the welfare and happiness of others. In the beginning stages, you must conceptualize devotion and work at it, bringing it again and again to mind. This is known as “fabricated devotion.” With practice, devotion becomes increasingly natural until one day it spontaneously springs forth powerfully from your heart. This is “unfabricated devotion,” which is indestructible. Photo of Ven. 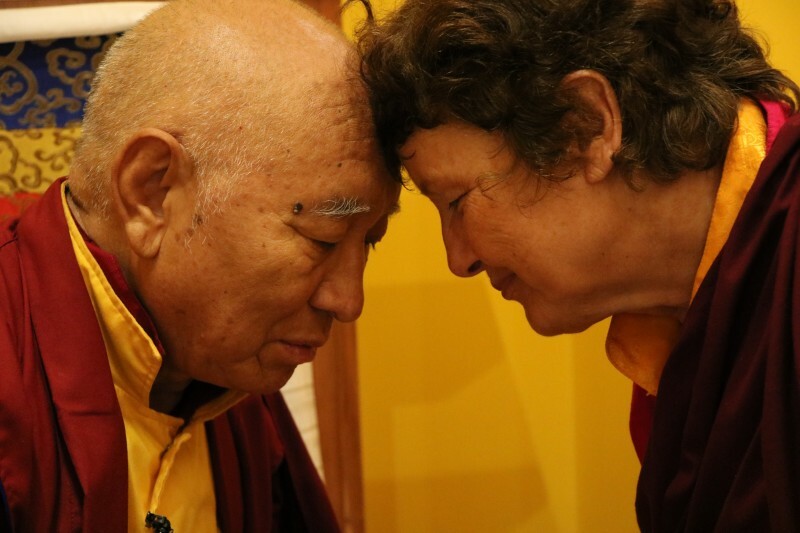 Khenpo Tsewang Rinpoche blessing Lama Jomo Lorraine during the Inauguration of the Yeshe Tsogyal Temple in Nashville, TN on September 23, 2018, by Stuart Bernstein.